One of the easiest ways to reduce holiday expenses is to shop online for deals. Comparison shop for flights, accommodation, car hires or combine all three with package deals. Many travel websites offer sales and booking discounts throughout the year so be flexible with your timing and your plans and cheap holidays should be much easier to find. Consider low-cost destinations. Research countries that are slightly off the beaten track as these are very likely to be less expensive than established holiday meccas. Look into up and coming countries which are looking to develop tourism, such as former Eastern Bloc nations like Serbia and Montenegro. These destinations are often great value for money and are considerably less touristy than many mainstream choices. When researching holidays, consider peak seasons. Prices soar during popular travel times like bank and school holidays so it’s wise and cost effective to travel during low season. The benefits of traveling off-peak are not only financial; destinations are sure to be less crowded as well. Many people tend to book summer holidays in January. Even with sales, prices during the beginning of the year are inevitably higher than later on so remember to be patient and wait for prices to drop. There are also a lot of last-minute deals online when airlines and hotels need to fill seats and rooms, so if you’ve don’t mind when you travel, you might be able to land a bargain-price holiday. 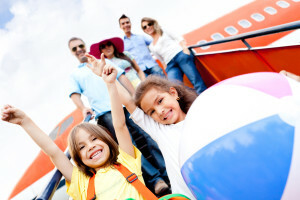 Once you’ve booked your travel arrangements, consider making a budget for your holiday. Determine what you can afford to spend and be realistic with your estimates. An overall budget should be a figure that encompasses all your holiday spending from taxis to hotels and should be an amount of money you feel comfortable parting with. Beyond your overall budget, consider a daily spending limit. Work out rough costs for meals, transportation, entertainment and souvenirs, incorporating some leeway for indulgences or a general contingency fund. This will avoid being disheartened if you should exceed the budget. One surefire way to stick to a budget is to travel with a prepaid card. Using this type of card can reduce fees for foreign cash withdrawls and stretch your budget that much further. If you pre-load a card with your exact budget, you can stick to your financial plan while you’re travelling, without wondering if you’ve overspent. Prepaid options are also a great way to protect yourself against identity theft or fraud as there’s no specific account information. The best way to plan a budget holiday is to know before you go. Be sure to do your research and be thorough. Comparison shop online, register for alerts and travel off-peak to ensure you’re making the most of your holiday and your financial resources. Plan your budget realistically and consider every possible add-on and potential expense. Being well-prepared ahead of your trip will ensure that things run smoothly so you can enjoy yourself to the fullest and have nothing but fond memories of your well-deserved holiday.